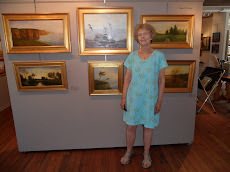 The Lyme Art Association, Old Lyme, CT has four large, well lit gallery rooms that display representational art. Two of my paintings were just accepted for their current show On Holiday-The Artist Travels, on display from March 2 - April 21, 2012. This painting was done en plein air from the Salisbury boardwalk which goes through the marsh. It's a wonderful place to walk and enjoy the scenes of the marshes and watch the numerous birds. Late in the day and of course the sunsets are the best time to go. Ireland, what can a say? The beauty of the countryside is amazing. In the painting below I tried to capture the trees at Muckross Castle as I remembered them. Traveling around the Beara Peninsula brought a new amazing scene at each corner. Mountains of stone and purple flowering Rhododendron, fields of cows and sheep grazing close to the road, seascapes with cliffs dropping steeply down to the water, quaint cottages overlooking the sea and towns where each quaint home is painted a different bright color.